Prakool “Constant” Shreevats, graduated with a B.Tech in Chemical Engineering in 2011. He was the Institute Hockey Captain (2010-11) and a resident of Godavari Hostel. A proud occupant of Godavari Hostel, and a determined hockey player, he was in the hostel Schroeter team in his first year being the only one from NSO Hockey. His first year in Schroeter ended in immense disappointment, as Godavari made a first round exit in the knockout tournament, going down to giants Mandakini, who had five players from the institute team. Godavari was perhaps no match, since they hadn’t a single player from the Institute team. However, he wasn’t very far from extracting sweet revenge, as the Godavari Hostel team practiced round the clock for the Schroeter in 2008, his third semester, and made it to the semifinal with a shade of difficulty. The semifinal pitted them against Mandakini again, only a year since their previous meeting, with Godavari emerging shock winners, breezing past Mandakini with a 3-0 scoreline. The big prize was yet to come though, as, amidst loud cheers, they won the final , and bagged the gold, which had finally made its return to Godavari after a ten year gap. As a result of their outstanding performance, 4 of their players were offered positions in the institute team, namely Foyu, Chumban, Tatte and Constant. According to Constant, one of the two most memorable events of his life at IIT Madras was winning the hockey schroeter. 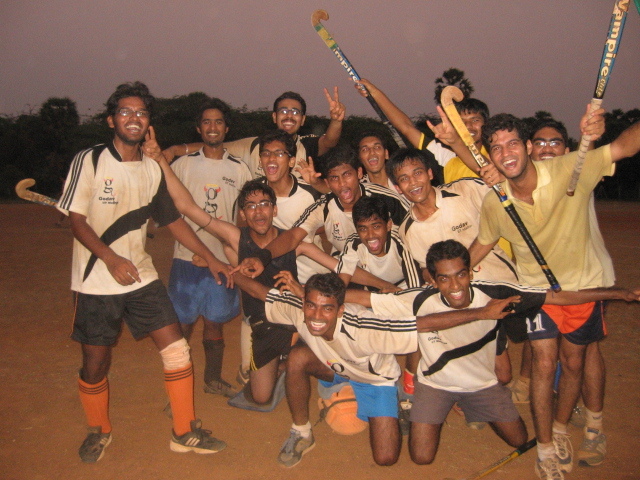 In Inter IIT 2008, IIT Madras failed to make it to the hockey finals on home turf. However, the performance wasn’t as disastrous as 2009, where IIT Madras was blown away on three consecutive days, losing 3-0 to Roorkee, 4-0 to Bombay, and again 2-0 to Roorkee, failing to score a single goal. Thus, the team was unable to muster a podium finish, let alone a victory for 6 straight tournaments. This was due to a lack of well experienced coaches, and poor bonding and team spirit among the players. However, the team were awaiting a dream performance in 2010, with Constant, the hockey captain, inspiring the team, and trying to erase past washouts. Constant was in charge of building a combined IITM XI, with as less interference as possible from the sports administration of the institute. The hockey goalkeeper was elected the sports secretary, which was a lucky break for the sport, as more focus was given on hockey, including the appointment of a new coach for the team, which was practicing without trained faculty, prior to this. Altogether unbelievable, IIT Madras waited for the gold to return as everything slid smoothly into place with no more sparks flying about the dressing room. The tourney was held at IIT Delhi. Day 1 witnessed a dismal performance from IIT Madras, with teams of almost all sports losing. Most of the other IITs didn’t expect Madras to win even a single gold. The sports secretary tried to pump vigor and will into the team, and almost immediately, the unexpected energy rose out of its shackles. From Day 2, the tables were turned, as IIT M went thirsting for blood, winning the majority of its games. Nearly 5 teams made it to the finals in their respective categories, including the hockey team, which were perhaps the most unexpected ones to be seen entering the hockey stadium on the final day, Day 6. The first finale of the day was hockey, with Madras facing Bombay. The match was tied 1-1 at full time, following which it went on to extra time, penalty strokes, and then sudden death as both teams desperately tried to break the deadlock and make it past the opposition’s defensive blanket. The stadium atmosphere was electric, as one of the Bombay players walked up to take the 2nd stroke of sudden death, with Madras having scored on their chance. The goalkeeper’s eyes had intense concentration, the striker struck the ball, and the goalkeeper made a brilliant save. The entire team ran out onto the pitch with most of the players, throwing their shirts away in a celebratory gesture – an unbelievable win, everyone half-expecting to wake up and find that it was a dream. “Unforgettable” was the way the match was dubbed by Constant, the tournament’s top scorer, who experienced the same feeling of déjà vu as he had when he won the Schroeter finale. He sprayed the words “Who won Inter IIT, IIT Madras” on the walls of the institute, and he still has the same spray can as a memento as Madras romped to the General Championship Trophy. Constant is now preparing for the Civil Services, and planning an institute reunion in the near future. He arrived at IIT Roorkee in 2012, to cheer for his beloved hockey team, who made him proud with a third consecutive win in hockey, a year after their win at IIT Kharagpur in 2011. Simply amazing isn’t it – a team that couldn’t finish in the top three for six straight years coming 1st for 4 consecutive seasons.